Another random blog, you ask? Nope! I fooled you all! The two subjects of today's blog are definitely linked. First, the Spurs. Let me give you a quick run-down of my night last night, which started with an afternoon conversation. Carly: What do you want for dinner tonight, Seth? I think I'll cook something so we don't have to go out to eat again. Seth: Well, the Spurs are playing tonight. Seth: Last game we won, we ordered pizza from Louie's, so that's probably good mojo. We should order it again. Carly: We're going to get fat. Seth: It's for the Spurs, Carly. Anything for the Spurs. Carly: Nope. So, how about if I cook something Italian, because that's at least in the same family. And it's likely that if pizza from Louie's brought us good luck, then if I cook Italian food, it'll also be good luck. So I'm going to send you a list of ingredients, you just go ahead and buy what's on the list, and I'll cook us a good-luck Italian meal. Seth: Ok, if you're sure. End of phone call. I write all this to say that I like the Spurs a lot. After 2 years of dating a maniacal fan, I've definitely come around. However, I'm a fan in the sense that I watch the games (playoffs only--come on, people, that is a LONG season, so let's be reasonable), I cheer when Manu makes a 3-pointer, and I totally back Timmy up when he flops for the 47th time in a game. However, I am not a fan in the sense that I'll grow a beard because I think it's good luck (this is hypothetical--work with me! ), or wear the same shirt for ten days in a row without washing it because they won a game last time I wore it. Seth would and likely has done each of these things, and more. I won't go into it all, because it may frighten you for me. But I really love this about him. In a strange way, it's great to see him so passionate and dedicated. And it's a fun thing that we can enjoy together. Last year, when the Spurs won the National Championship, we went down to San Antonio to celebrate. Here are a couple pictures. It was an awesome trip, and for more reasons than just loving to travel, I hope they beat the Lakers and pull it off again this year so we can go again. Go, SPURS, GO!!! So, one can reason: if one can become a Spurs fan just by being around someone else who lives and breathes the Spurs, one can also become an Italian by being inundated with Italian heritage, food, and lifestyle from the time they are born. Am I right, or am I right?? My step-great-grandpa was Italian. Straight from Italy. He was around for the first 6 years of my life, and as weird as it sounds, I remember him pretty well! He talked with a funny accent, and he made really, really good food. My large (in numbers, not in girth! ), boisterous family, half of whom are Italian thanks to great-grandpa LaRosa, had tons of family get togethers, where all sorts of Italian dishes would be served. From a big pot of spaghetti and meatballs to delish Italian sausage and pepper sandwiches, we had it all. While my dad wasn't one of the lucky ones to have the Italian gene passed down to him (my grandma was born before her mom married Grandpa LaRosa), he always told me, "Carly, we may not be Italians in our blood, but we're Italian at heart." Thank you, Dad. I believe and embrace that, no matter how many times Seth points out that I'm Croatian and should stop pretending to be Italian. however! kudos to what looks very much like home made pasta!!!! (not as easy as the foodnetwork makes it look) :) did it come out tasty!? 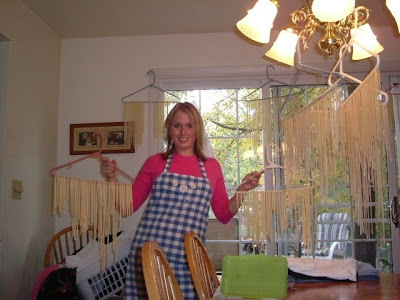 my last experience making pasta from scratch was for my nutrition class, and a "mystery" theme ingredient + lots of restrictions (and only about 5 hrs to produce completed dish) it was a DISASTER!!! horrible... i blame it on the stupid ingredients we had to use (did i mention it was all vegetarian dietary restrictions as well!?) and the time frame..
Haha, so you left out part of the story, which I'm SURE is Seth being pissed and blaming your food choice for that teeny little loss. Carly, if you'd just ordered the pizza!!! :) Ha! Hubby: so, who do you guys think will end up in the NBA championships this year? Major: I hope it's the Lakers and the Pistons. That would be a great game. Hubby: yeah, my wife's a huge Spurs fan, so I think I'm going to have to disagree with you. Major: You know what? I was stationed in San Antonio and I wanted to hate the Spurs just because everyone loved them. It was a long four years. But actually, I have to hand it to them. That's a team full of pretty genuine, classy guys. Turns out they're hard to hate. So, it's fine if you want to be a hater, but who really do you hate? You want to talk about obnoxious, let's talk about Denver Nuggets fans, or Carmelo Anthony. Or Kobe Bryant. Or freakin' Jason Kidd...though for different reasons. It's the NBA, folks! Probably everyone on that payroll is some kind of jackass, and maybe Tony Parker is too. But I'll tell you what: David Robinson was NOT, and neither is Duncan, and anyone who believes differently is smoking something. We may not win this year and that's ok. Our hands are pretty full of rings anyway. We'll take some time off, get some fresh blood, and let Timmy train them to be the best damn ball players ever. Go Spurs. Now and forever. Oh, and Carly, you're an amazing cook, and this has all made me really hungry. Apple pie, soon?! lol.. sorry! i'll be sure to just EMAIL you if i want to leave a note.. i thought i was just leaving YOU a comment... (who knows me, and what i mean...) i didn't mean to get anyone screamin from a soap box! HA! I love that you are becoming Italian! I totally buy the fact that you are what you hang around... Hmmm... Maybe that is not always a good thing! :) As far as the SPURS go, I can't comment... I dont follow very closely, BUT I do LOVE college b-ball! GO GATORS!